Discharging a .338 Lapua Magnum round with a cleaning rod in the barrel — that’s a recipe for disaster. What happens when a fired .338 caliber bullet and a cleaning rod try to occupy the same place at the same time? Well you get a catastrophic kaboom, with metal pieces flying all over the place, and a shooter very lucky to escape without serious injury. 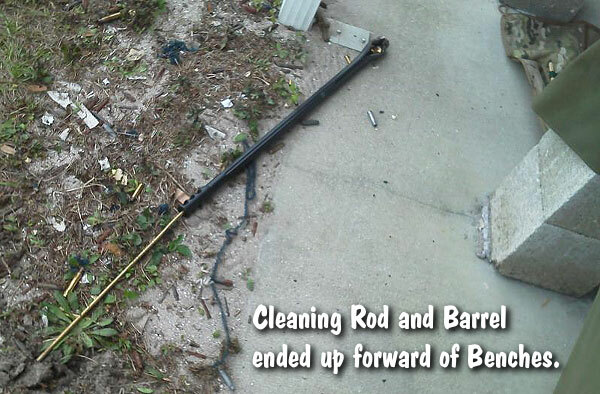 This incident occurred recently in Manatee, Florida, as reported by Sniper’s Hide member Queequeg. We thank SnipersHide.com for granting permission to publish these revealing images in the Daily Bulletin. CLICK HERE for more Kaboom info on the ‘Hide. This story should serve as a chilling reminder to follow proper safety practices whenever you are at the range. Always check to make sure there is no obstruction in the bore BEFORE loading a live round. 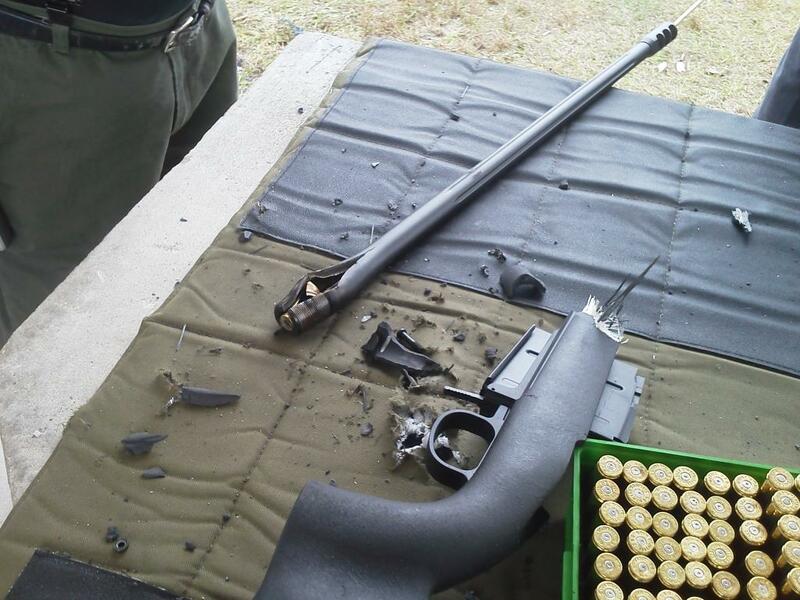 .338 Lapua Magnum + Cleaning Rod + Inattention = Kaboom! Sniper’s Hide member Queequeg recently published shocking photos of a catastrophic kaboom involving a .338 Lapua Magnum (Savage action). The action was blown off the rifle, shrapnel went through the roof, and the barrel split at the tenon before taking an excursion downrange. The action did crack in the front but the lugs remained engaged so the bolt did not slam to the rear (luckily for the shooter). To learn more about this incident, go to the original Snipers Hide Forum Thread. There you’ll find more details and over four pages of related discussions. What did the .338 LM shooter do wrong here? You will say — “Well that’s obvious, he left a cleaning rod in the barrel and then shot a round.” Yes, that was a potentially fatal error. But that was his second mistake — one that occurred only because he made a more fundamental judgment error first. The FIRST mistake was not acknowledging the problem with his ammo. Had he heeded the warning signs, he would still have a rifle (and an unsoiled pair of trousers). When he first observed that he was having problems with extracting cases, a warning light should have gone off in his head. Presuming his extractor was not broken (and that the chamber was cut properly) he should have been able to extract his brass if he was running safe loads. The lesson here we all need to learn is that if you observe a serious ammo-related issue, it is time to stop shooting. Don’t try to invent work-arounds just to extend your range session, when there are clear signs that something is wrong, very wrong. 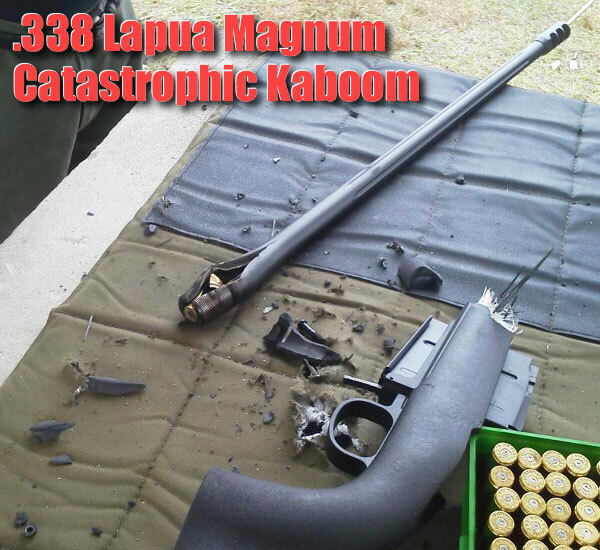 Share the post "Your Worst Nightmare: Catastrophic .338 Lapua Magnum Kaboom"
Planning a new tactical or hunting rifle project? 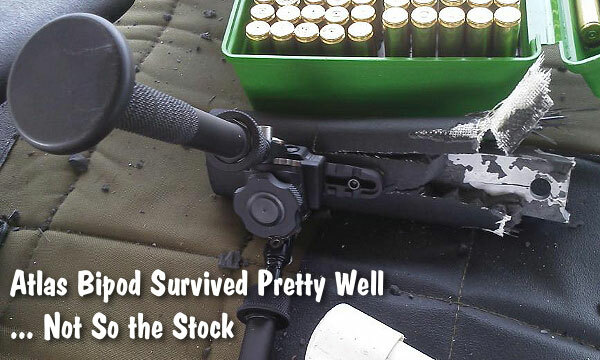 You may want to consider a Howa barreled action for your new rig. Brownells has a large supply of these well-made Howas in a variety of chamberings, including the popular 6.5 Creedmoor. You can just bolt this barreled action into the chassis system of your choice. These barreled actions start at $359.99 complete with two-stage trigger and magazine. 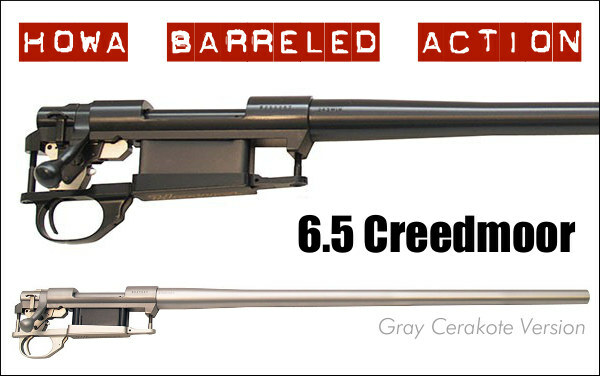 The 6.5 Creedmoor barrelled action with 24″ Heavy Barrel is $449.99 blued, $479.99 blued/threaded, or $546.00 Cerakote Gray. Many other chamberings are carried by Brownells, including: .204 Ruger, .222 Rem, .223 Rem, 22-250, 6.5 Grendel (Mini), 7.62×39 (Mini), .243 Win, 7mm-08, .308 Win, .270 Win, .30-06, 7mm Rem Mag, .300 Win Mag, .338 Win Mag and more. Howa barreled actions are ready to drop into stocks or chassis systems for quick, DIY bolt-action rifle builds. These barreled actions are available in a wide selection of calibers, barrel lengths and profiles in both blued finish and grey Cerakote. Some have threaded muzzles for easy attachment of suppressors or other muzzle devices. Actions have factory-installed two-stage HACT Trigger, and internal 5-round box magazines. Detachable-mag bottom metals and extra magazines are also available. Actions are ready to accept scope bases and rails. Brownells currently has more than 75 versions of Howa barreled actions. Share the post "Howa Barreled Actions in 6.5 Creedmoor (and More) at Brownells"
Ernie Paull from California was an active competition shooter for many years. However, his eyesight has declined so he has turned his attention to providing components for shooters and gunsmiths. 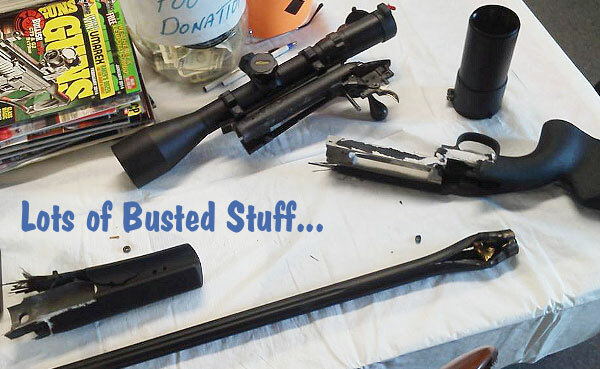 Through his Ernie the Gunsmith website, Paull sells a variety of useful products including gun trigger springs, pillar-bedding kits, Accu-Risers, and pillar installation tools. 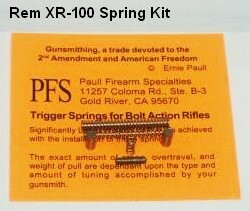 This Bulletin post focuses on Ernie’s trigger springs. Ernie offers springs for a wide variety of rifles: Browning (A-Bolt, A-Bolt 22), CZ (m452), Kimber, Remington (XR100, XCR, 7, 700, 722, 788, 7600 and more), Ruger (77, 77-22, LC6), Tikka (T-3), Weatherby (MK-V), and Winchester (M-70). 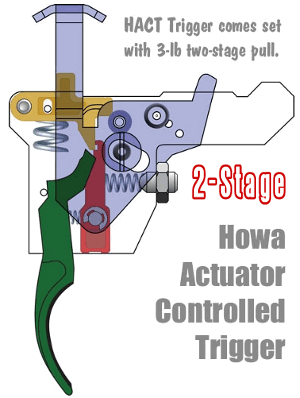 While there is more to a good trigger job (in most cases) than just a spring swap, you need to have the proper rate spring when adjusting trigger pull weight downwards. NOTE: For safety reasons, we recommend you consult a competent gunsmith before modifying factory triggers. Share the post "Replacement Trigger Springs Available for Major Brands"